Posted April 17, 2017 by admin & filed under Skincare. While not the most flashy or trendy product there is, Sunscreen may well be the single most important skincare product available, period. Below are 5 reasons you should be wearing sunscreen EVERYDAY. 1) Skin Cancer Prevention … Overexposure to UV rays from the sun is the leading cause of skin cancer. More than 3.5 million cases of Basal & Squamous Cell Cancer are diagnosed each year, while upwards of 76,000 people are diagnosed with Melanoma (the deadliest form of skin cancer). If for no other reason, we should all be wearing sunscreen regularly to protect ourselves from the potentially deadly effects of overexposure. 2) Anti-Aging Benefits … A strong argument could be made that Sunscreen is the number one most effective anti-aging skincare product available anywhere. Much of what we refer to as aging of the skin is a result of repeated UV exposure. If you don’t believe this, compare the condition of your skin in areas repeatedly exposed to the sun to skin that is more regularly covered by clothing. It’s a safe bet that the skin that gets kept covered is softer, with less wrinkles and a more even tone. The skin on your face, neck and the back of your hands is more likely to be showing signs of aging (wrinkles, age spots, uneven texture, etc.). A big reason for this is that UV Rays from the sun take an unhealthy toll on the health of our skin and cause it to age more quickly than it should. 3) Sets an Example for Children … As the saying goes, if only we’d have known then what we know now. We can be the voice of reason that helps prevent our children from one day wishing they had done more to take care of their skin when they were younger. Make a habit of teaching your children how, when and why to apply sunscreen. Protect them and yourself by making sun protection a priority. Damage from UV exposure is cumulative and occurs over a lifetime. The less damaging exposure we accumulate as we age, the less chance we have of developing skin cancer and the less rapidly our skin will age. 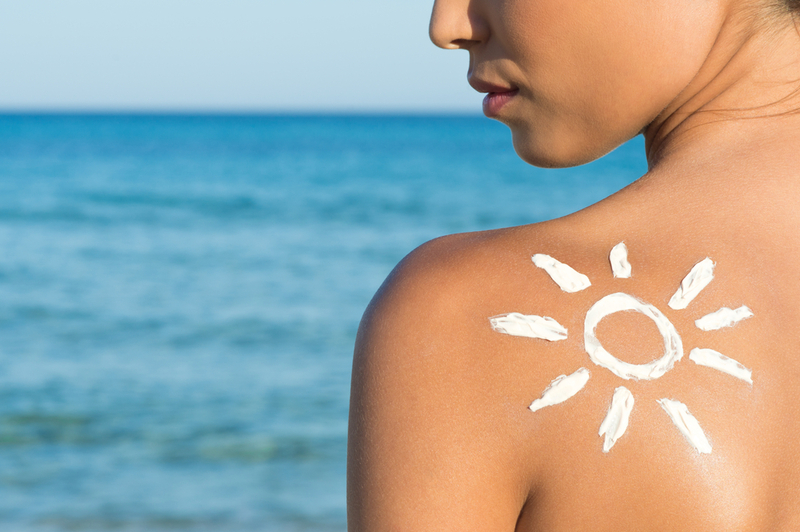 4) Important for All Skin Types … Even if you don’t burn easily, wearing sunscreen is still important. While more common in those with lighter complexions, skin cancer doesn’t discriminate and can affect all skin types. Those with darker skin, while less likely to develop UV related skin cancers, are at risk of more serious forms of skin cancer if/ when they do get it. 5) More Choices Available … Increased awareness of the dangers of UV exposure has led to advances in technology and an increase in choices of ways to protect ourselves. If the word sunscreen immediately reminds you of the embarrassment you felt as a child when your dad walked around with his face covered in white, pasty zinc oxide, fear not. Those days are long past. Todays’ sunscreens are much less noticeable and they come in many convenient forms such as lotions, sprays, sticks, etc. Some are combined with quality moisturizers so you can cover two important skincare bases with one product. Some companies are even offering comfortable, lightweight lifestyle clothing with SPF protection built in. If you’re already a regular sunscreen user, keep it up! If not, we hope this article has convinced you of the importance of making a change right now. Thank you for reading and please don’t hesitate to contact us with any questions you may have regarding this or any other skincare related topic. We would love to help in any way we can.